These heavy-duty Ruger Economy Engine Hoists have a built-in extendable multi-position boom that provides more horizontal and vertical reach. Legs are in a fixed position. RC-500 500 lbs. 31-3/4" 32-3/8" 42-3/8" 16-1/4" 96-1/2"
RC-1000 1,000 lbs. 34-7/8" 41-3/4" 53-3/4" 16-7/8" 113-38"
RC-1000S 1,000 lbs. 32-3/4" 46-1/8" DNE 9-3/4" 116-1/2"
RC-2000 2,000 lbs. 33-1/2" 45" 86" 6-3/8" 109-1/2"
RC-3000 3,000 lbs. 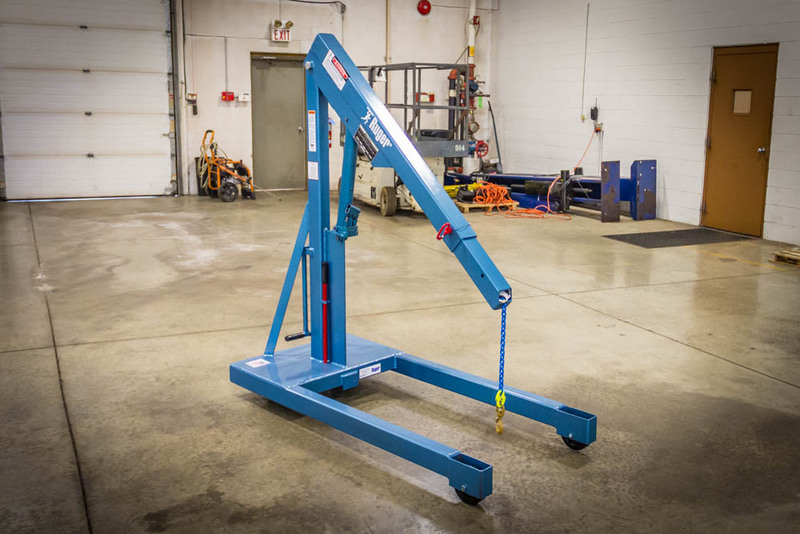 34-1/4" 48-1/2" 80-1/2" 34-1/4" 118-7/8"
With capacities up to 3,000 lbs, the Ruger Economy Straddle Cranes do not sacrifice quality for value. Built to the same Ruger stringent specifications as our other products, the Economy Series offers the most durable, versatile and dependable crane at this price point in the industry.